At least 40 people were killed in Taliban attacks and explosions in southern Kandahar, eastern Ghazni and Paktia, as well as western Herat provinces on Tuesday, officials and media reported. At least 20 people were killed when explosives placed inside two containers blew up in the city center of Kandahar city, the capital of the province around noon, Daud Ahmadi, a spokesman for the Kandahar governor, told dpa. At least 37 others were injured in the incident, Ahmadi said. The target of the attack was not immediately clear. Meanwhile, six policemen were killed and five others were taken hostage by the Taliban in the Zurmat district of Paktia on Monday night, Afghan news agency Pajhwok reported, citing a police official, who spoke on condition of anonymity. In Herat, two policemen were killed and seven others were injured during a clash in Keshk-e Kohna district, Lal Mohammad Omarzai, the district's administrative chief, told Pajhwok. In Ghazni, at least 12 Afghan security force members were killed in the latest wave of attacks launched by Taliban militants in several parts of the province, officials said on Tuesday. The police chief of Deh Yak district - Sayedullah Tofan - and a reserve police commander were among those killed in the attacks on three administrative centers across the province, Arif Noori, a spokesman for Ghazni's governor, said. At least 15 Afghan security force members were wounded in one of the attacks when Taliban militants destroyed a number of checkpoints and set fire to Deh Yak police headquarters at around 9 p.m. (0430 GMT), Noori said. The fighting was still underway and being supported by reinforcements from the provincial capital, Noori said. Provincial council members, Nasir Ahmad Faqiri and Ghulam Sakhi Ammar, also confirmed that the fighting was ongoing, but did not provide details about casualties. According to a report by the Office of Coordination for Humanitarian Affairs (OCHA) on Tuesday, fighting in Ghazni province in the past week has displaced more than 10,000 people. 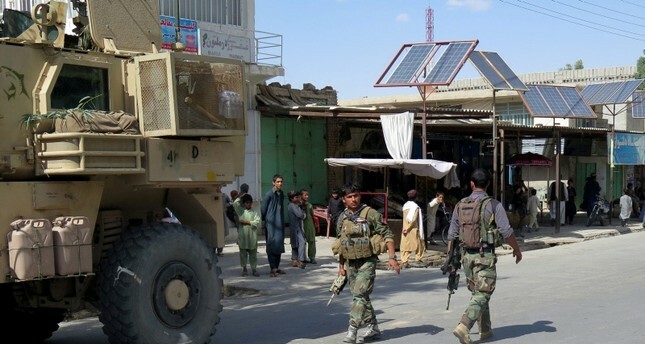 The Taliban are ramping up attacks on the security forces, government installations and district, as well as provincial centers and are spreading exhausted security forces thin. The Taliban have increased pressure on Ghazni, with the militant group attacking a number of districts over the past week. At least 21 policemen were killed across five districts in Ghazni when the Taliban mounted attacks on Afghan security forces during 24 hours starting last Tuesday. Also last Tuesday, the Taliban briefly captured large parts of a provincial capital in western Afghanistan. The temporary loss of Farah was a shock to the government and only the second time the Taliban managed to overrun a provincial capital, after the northern city of Kunduz fell in 2015.